It’s finally December, so let’s bring on the gingerbread! 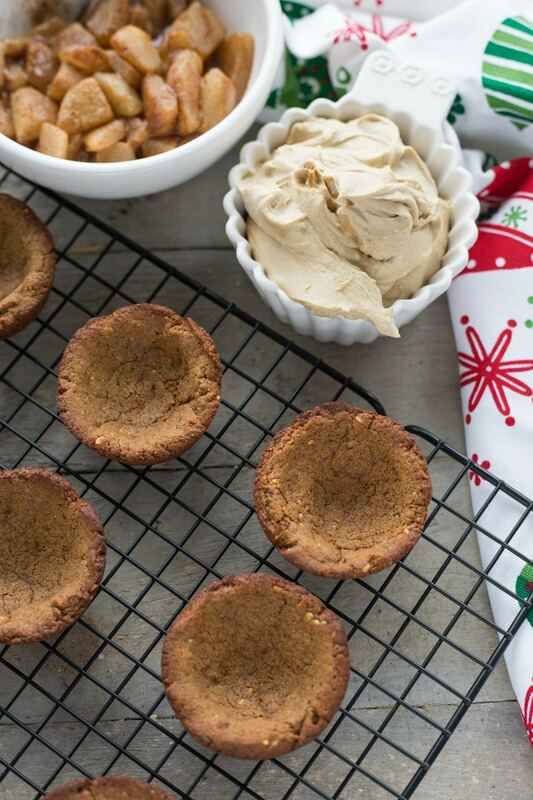 Or even better, let’s bring on these Spiced Pear Gingerbread Cookie Cups! How is it only 24 days until Christmas? Wasn’t it just Halloween? I don’t know about you, but this fall is just flying by! Don’t get me wrong, I’m not upset about it. I’m actually excited about the start of December and all the Christmas festivities we have planned! And this year, I’m determined to savour every moment! While we have some new things planned this year, we also have our traditions that we love doing every year. For instance, my husband and I usually watch every Christmas movie we own (we are talking over 20 plus movies!) and drive around our childhood neighborhoods to look at Christmas lights. What types of festive activities and traditions do you have planned for the season? Another one of my favourite Christmas traditions is excessive baking! I bet you never would have guessed that!?! 😉 And these Spiced Pear Gingerbread Cookie Cups are definitely going to be a part of my baking traditions going forward! They’re a new fave of mine for two reasons: I love all things gingerbread; and they’re so easy to make! And, as a bonus, they look a little fancy! A perfect little dessert for Christmas day perhaps?! The recipe for the cookie cups is actually a twist on the crust I use in this almond butter strawberry shortcake tart. Except I added some ground cinnamon, ginger and cloves, and substituted molasses for honey. These cups are crispy and chewy with a nice hint of ginger. I could eat them all on their own without any filling! But the filling of spiced pears and molasses coconut cream is actually quite delicious, so don’t pass it up! To make the filling, I just chopped up some Bosc pears and tossed them with some lemon juice, coconut sugar and spices, and cooked them over a low heat. Then, I just whipped up some coconut milk with molasses and spices, assembled the cookie cups and voila! Fancy dessert all good to go! These are definitely on my list to make for one of my holiday gatherings this year! Hopefully it ends up on your list too! If you make them, be sure to let me know how they turn out! 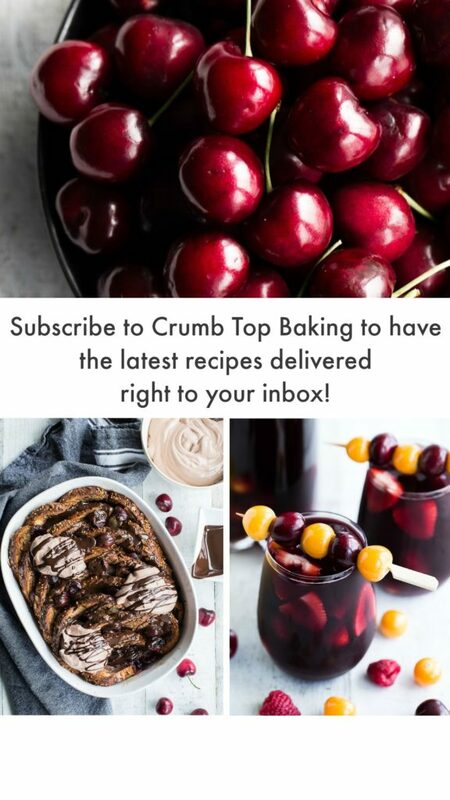 Or share a photo on Instagram by tagging @crumbtopbaking! And don’t forget about the Sweetest Season Cookie Exchange going on this week! Check out all the festive recipes by my fellow food bloggers! And check out our fundraising page for ways you can contribute! Enjoy the first weekend of December! 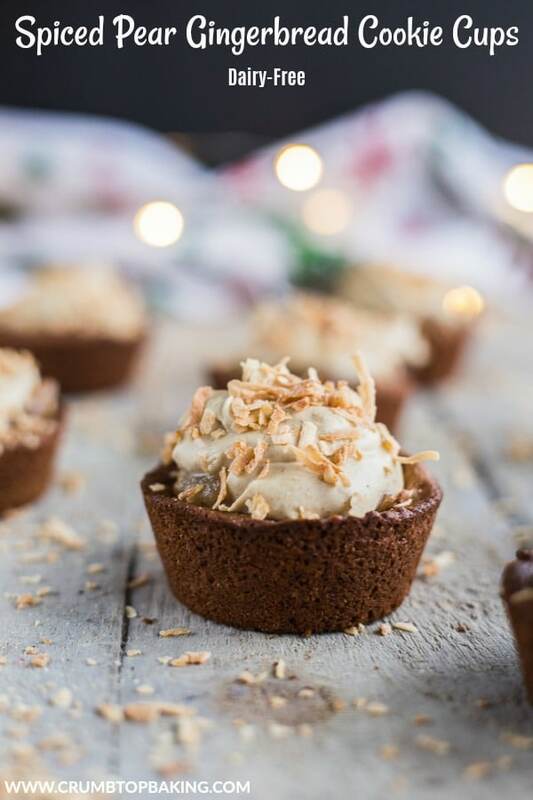 With a gingerbread cookie base, topped with spiced pears and molasses coconut cream, these Spiced Pear Gingerbread Cookie Cups make the perfect Christmas dessert! Pre-heat the oven to 375F and grease a regular-sized 12-cup muffin pan. In a large bowl, add the almond butter and coconut oil and beat with an electric mixer on high-speed until well combined (approximately 3-5 minutes). On a medium speed, add the molasses and beat for about 30 seconds. Then, add the sugar and beat for another 30 seconds. Finally, add the egg and beat until the mixture is well combined and creamy. You may need to scrape down the sides of the mixing bowl as you go. In a separate bowl, sift together the flour, cinnamon, ginger, cloves, baking powder, baking soda and salt. With the mixer on a low-speed, gradually add the dry mixture to the wet mixture and beat until a dough forms. Roll the dough into 12 balls and press into the prepared muffin cups. Using your fingers, shape the dough around the sides of the muffin cups to form little cups. Bake in the pre-heated oven for 5 minutes. The cups will puff up a bit. Remove from the oven and carefully press down the cups with a teaspoon in order to maintain the cup shape. Place back in the oven and bake for another 3 – 5 minutes, or until the edges of the cups are slightly browned. (Do not over-bake as the cups will continue to firm up once removed from the oven). Remove from the oven, and let the cookie cups sit for 15 minutes before transferring to a cooling rack to cool completely. Add the chopped pears to a greased frying pan, and toss with the lemon juice, coconut sugar and spices. Cover and cook on low heat for 15-20 minutes, or until the pears are tender. (Stir occasionally to ensure the pears do not burn on the pan). Remove from heat and let cool. To prepare the coconut molasses cream, refrigerate the can of coconut milk overnight. Scoop the solidified coconut milk off the top and add to a bowl along with the molasses and spices. Beat on high with an electric mixer for 3-5 minutes, or until the coconut milk is creamy. 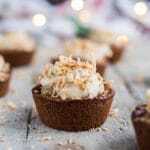 Add spoonfuls of the pear mixture to the cookie cups and top with a dollop of coconut cream and a sprinkle of toasted coconut. Store any leftovers in the refrigerator and enjoy within a day. If you’re planning to make these Spiced Pear Gingerbread Cookie Cups for an event, they are best made the day of. Once assembled and refrigerated, the cookie cups lose some of their crispy texture. You can also make these a day in advance and assemble when ready to eat. Just store the pears and coconut cream separately in the refrigerator and the cookie cups in an airtight container on the counter. These look SO yummy! I love the use of pear, what a unique flavor combo for a dessert! I used to love driving around looking at the lights as a kid! Now I’m excited to do it with my own kids! I’m so excited for all of the holiday baking – it’s the most delicious time of year! These gingerbread cookie cups have my name all over them. I love it!! That’s a lovely tradition to do with your own kids! And yes, I totally agree! This is the most delicious time of year! Hopefully I can find the time for all the baking I want to do!!! Happy weekend Katherine! Like y’all, we watch a bunch of Christmas movies, and I totally overkill the holiday baking. (But it’s so much fun! And there are always so many more new goodies for me to try!) 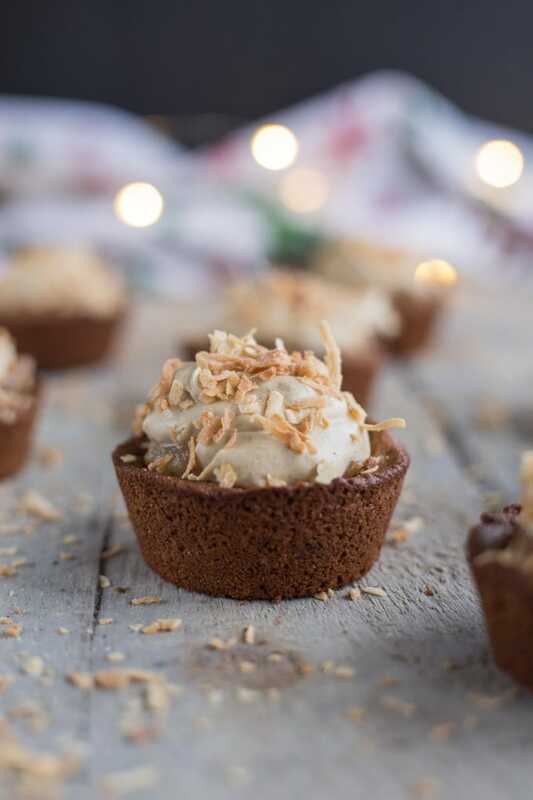 And the combination of pear and gingerbread in these cookie cups just sounds outright divine! I cannot wait to try these beauties! So glad you’re going to give them a try! Thanks for including me in this year’s cookie exchange! I had a great time participating and seeing everyone’s awesome creations! Happy Holidays Erin! What a great idea to turn cookies into a fancy dessert! I love little individual desserts for parties, and these look perfect. Thanks Julie! I’m definitely making these again over the holidays! The last batch didn’t last very long! These are the cutest Leanne. I love tiny bite sized desserts they look so adorable. And baking with ginger just sends that wonderful festive aroma through the house. Definitely pinning to bake this holiday. Thanks for sharing. Thanks Ashika! I always like creating individual, bite-sized desserts. They are so easy to serve and store! And the house is definitely smelling like gingerbread these days! ‘Tis the season! If you make them over the holidays, let me know how it goes! I love watching our favourite Christmas movies…even though we’ve seen them a bazillion times! And baking is definitely a must! Little individual desserts are move favourite and these are so cute! Love all the festive flavours going on here. I bet they smell absolutely amazing as the cups bake!! Thanks Dawn! I’m definitely making these again over the holidays! They are so easy to make and serve! As for the smell in the house, it has smelled like peppermint and gingerbread for weeks! Love it! OK yummm is all I can say to these. Baking enough to feed an army in December is my favorite Christmas tradition :). Hope you have a fabulous week! Thanks Kelsie! I love that Christmas tradition! ;) Happy baking! Christmas is one of the only times of year that I bake cookies because I eat too many when they’re around! haha Excessive baking is the fun of Christmas for me. 🙂 Gingerbread is my favorite holiday treat and I’m loving these wholesome cookie cups. The spiced pear sounds like the perfect touch! Thanks Marcie! Gingerbread is one of my faves this time of year too! I was actually eating the cookie cups on their own, without any filling! I excessively bake year round, but quickly give most of it away because I will eat it all! So I totally understand ;)! Real talk – I put ginger in just about everything (except for my morning eggs – bleh) so I’m literally obsessed with it. 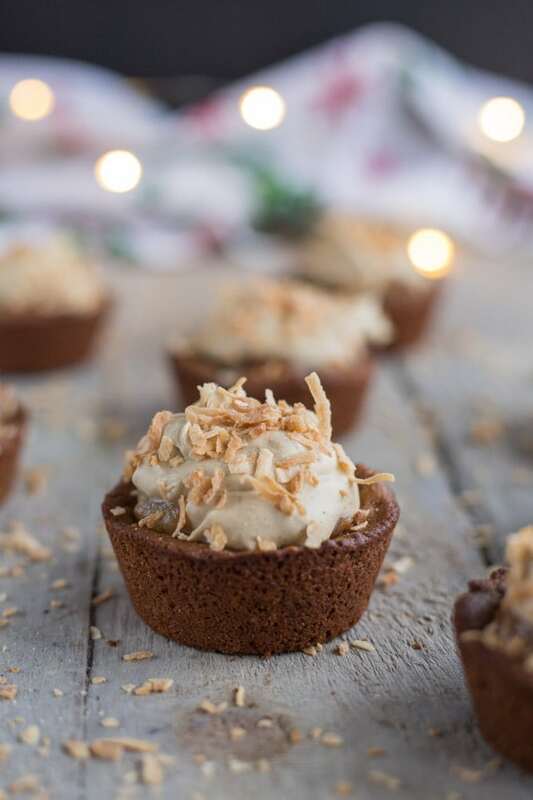 Ginger (anything) cookies are my all-time favorite holiday dessert, so you’re speaking my language with your adorable cookie cups! They look and sound utterly delicious! Thanks Christina! You’re too sweet! I love gingerbread year round, but this time of year it just makes the house smell so amazing!!! This is such a unique idea, and the flavors are just perfect for this time of year. Looking forward to trying these soon. Thanks LeAndra! 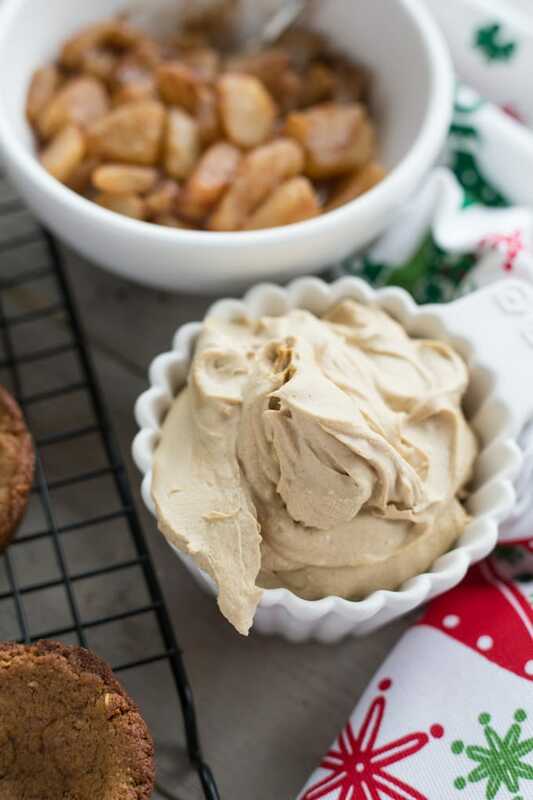 There is something about ginger and pears that’s so perfect for Christmas! I hope you get a chance to try them! Let me know if you do! These are just perfect for the holidays! Elegant and brimming with festive flavors! I love these!! Thanks Annie! These cookie cups definitely have a festive touch! They’ll be my go-to dessert for entertaining this holiday season!